We are located at 3764 Howell Branch Rd, Winter Park, FL 32792. Please refer to our brochure for dates, times and costs of classes. The following is a list of common questions that people might have about Aikido for Kids. Please feel free to ask any of the instructors or students if you have additional questions or concerns. The classes are open to students from 4 years old. Most children see good progress practicing twice a week. 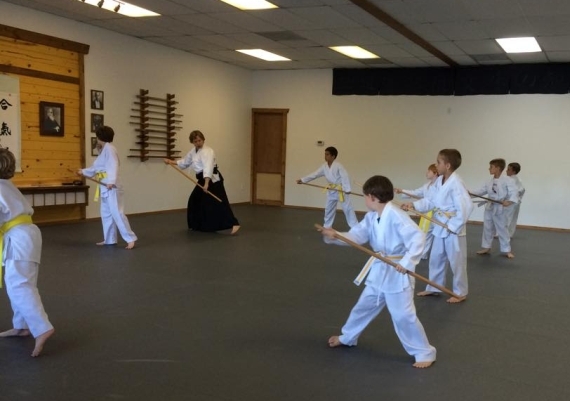 Membership entitles your child to all classes offered by Aikido Orlando Dojo. We encourage children to practice as often as possible. The more they put into it the more they get out of it. No. While children learn non-aggressive self-defense techniques, aikido emphasizes bringing balance and harmony to any situation. Children develop confidence that becomes apparent in their daily interactions. How will aikido benefit my child? Aikido is a multifaceted discipline where children learn focus, athleticism, confidence and how to master a complex art form. Children learn how to be a productive member of a group and how to be sensitive to others. Rather than seeking immediate gratification, they gain the kind of patience that allows them to see the benefits of long-term dedication. The philosophical underpinning of aikido points towards good social tendencies. Children learn an approach to life that follows them into the classroom, the playground, other physical activities and in their social interaction. Do I need to watch my child’s class? Although they are encouraged to watch as much as possible on a regular basis, parents may come and go during their children’s class time. We know that life can get hectic, preventing you from always being at your child’s class. What should my child wear for aikido class? Children may wear loose fitting clothes that cover the elbows and knees until you purchase a uniform for them. Uniforms can be purchased at the Aikido Orlando Dojo. If we don't have the the correct size, the students can be sized on their first day, and once ordered the uniform can usually be delivered to class for the following week. If you have any questions or require further information please contact the Aikido Orlando Dojo by calling 407-284-9598, or by e-mail at info@aikiOrlando.com.